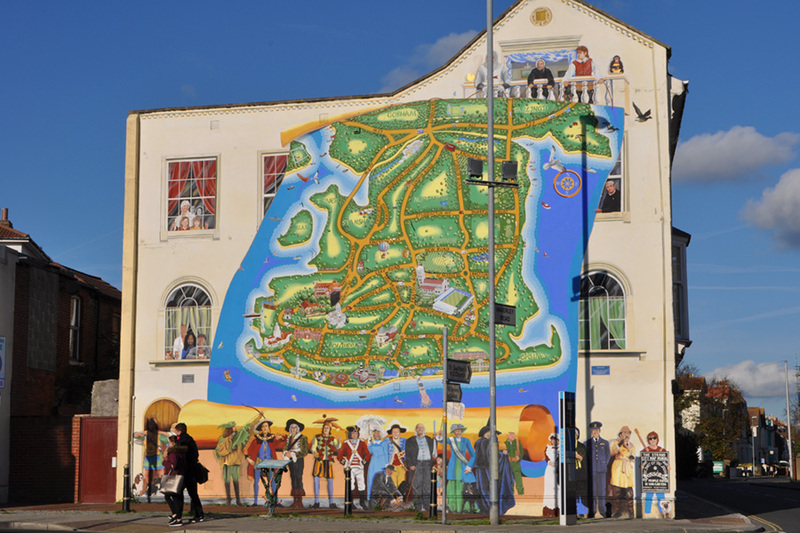 The mural on the Strand is one of the south coast’s most vibrant public art murals. 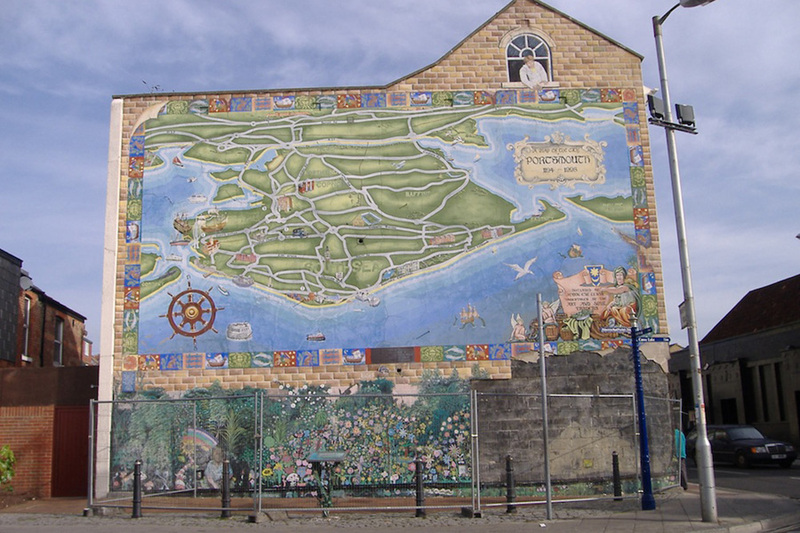 Refreshingly different with a nod to old-school English traditional style, it has masses of vibrancy and dynamism, and plenty of distinctive detail which illustrates over 800 years of Portsea Island history. Creation of this mural required a great deal of experience to get right as there are many ways to paint an exterior mural depending on the surface, location, and budget. There are many considerations such as the substrate, materials, weatherproofing varnish and the ability to fit in with the environment. This was painted on a south facing gable end wall, facing direct sunlight most of the day and just a few hundred yards from the beach and its salty sea air. I wanted this mural to last a lot longer than me so I sourced out the most durable paints in the world which are mineral based paints as they breathe with the wall, meaning with traditional paints they leave a layer over the surface and if water seeps behind it needs to exit somewhere and that is why it eventually bubbles, cracks and then peels off. But with these specialist Keim mineral-based paints the water flows through the layer of paint leaving no build up of damp or pockets of water. These paints are documented for lasting over 100 years and as we have the lease of the wall for 99 years I think we may have the most detailed street art in the country after the next 20-30 years? 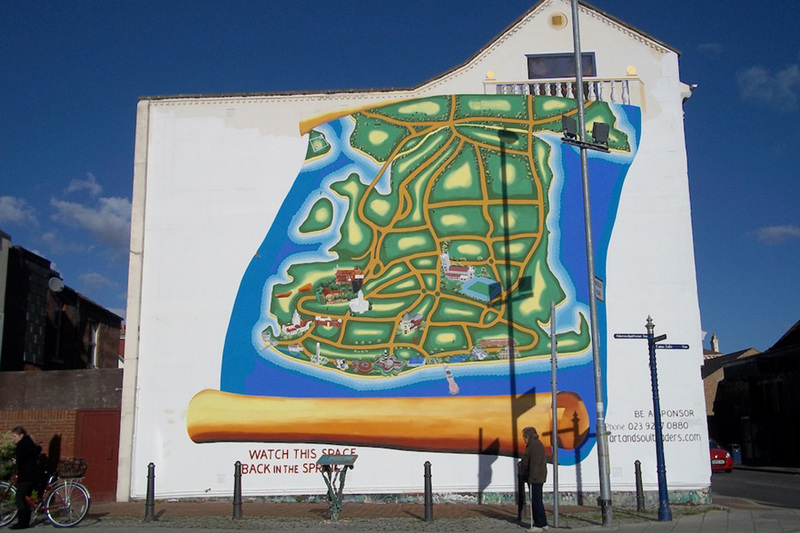 Here is a before and after comparison of the site as it was in 1996, and with the first Map mural which was completed in 1998 (but which suffered from damage in 2009). 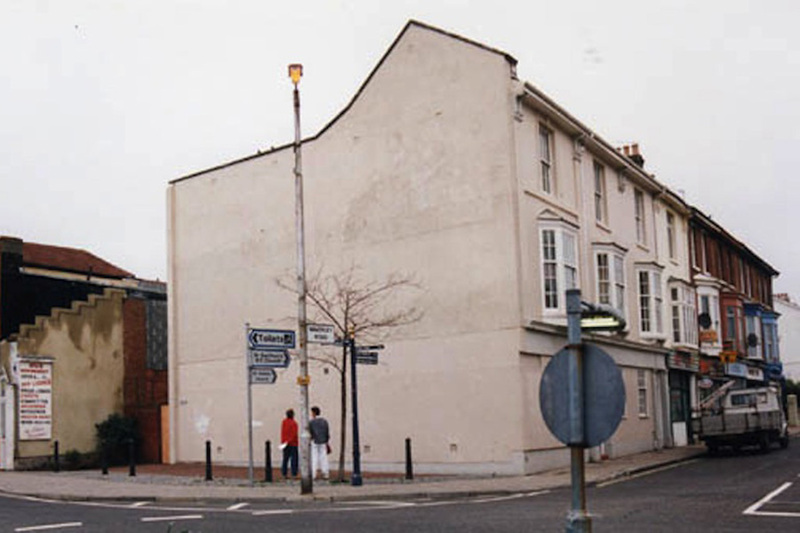 Following the render damage in 2009, the mural was completly redone in 2010. This slider below shows a comparison between the early stage and how it looked once completed.